I am pretty sure that if Joey had to choose, sandwiches would be his favorite dinner. And I'm certain that his choice would have nothing to do with the fact that it basically generates 3 dishes for him to wash - a pan, a knife, and a cutting board. I try and plan a sandwich night once every week or two. More in the summer - there are BLTs to be eaten then! I'm not sure where I got the idea for this particular sandwich - I'm sure I saw something similar somewhere, but I'm glad I made it - I've made my love for peaches quite clear, just as my love for sweet + savory, so it should come as a shock to no one that this was a big hit in our house. Peaches - good. Prosciutto - good. Brie - goooood. Seriously, is there anything that is not made better by the addition of brie? Butter one side of each piece of bread. Flip over and spread 2 slices with mustard and the other 2 slices with peach preserves. Preheat a nonstick skillet or panini press. 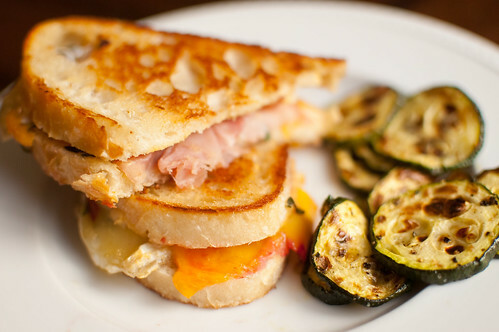 Layer the prosciutto, peaches, and brie over the prepared bread, and top with the remaining bread to make a sandwich. Cook 2-3 minutes per side, or until browned and crispy, and the cheese is melted. Allow to cool 1-2 minutes before serving. I don't love brie, but I do love adding peaches to savory dishes! This looks great! I've been on a HUGE prosciutto kick lately, so these look amazing! yum! I loved your strawberry goat cheese grilled cheeses and I know these will be delicious as well! I was looking for something different to do with peaches...These I will be serving this w/e guaranteed!!! Somehow I missed this when you posted it - how could!? What an amazing combo. I love peaches with brie. And adding the saltiness of prosciutto sounds even better. My appreciative husband and I just finished our last bites. So good! We had it on sourdough. I admire your creativity. Never would have thought of this clever combo. It was delish. Thanks so much.